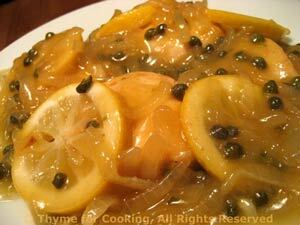 Thyme for Cooking Dinner tonight: Chicken with Lemon and Capers. 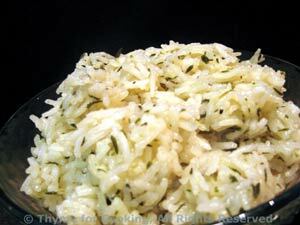 Lemon is the theme in this dinner, both with the chicken and the rice. Not a lot of chopping or cutting, and no long cooking: an easy dinner! Add garlic and sauté briefly, 1 - 2 minutes. Add stock, thyme and lemon juice. Cover and cook for length of time on package. I always have carrots in my fridge. They keep well so don't have to be used right away and it's nice to have a veg around in case of emergency! Besides, they're good and good for us! Melt butter and oil in a small skillet just big enough to hold carrots. 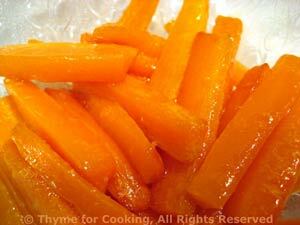 Add carrots and sauté 10 minutes, turning occasionally until they develop a golden color. Add stock, cover and continue cooking until done, another 7 - 10 minutes. Uncover, cook off pan juices and serve.